The most frequently asked question since our return home from Israel has been, “What was your favorite part?” That is nearly impossible to answer. There were too many wonderful experiences and highlights, each of them meaningful for different reasons. It strengthened my faith in the Word. No doubt about it, the places and people we read about in the Bible are REAL. Archaeologists continue to uncover locations, discover documents, and learn about practices that prove the truth of God’s Word. For example, the Bible mentions a place called “Sha’arayim,” which means “two gates” (Josh. 15:36; 1 Sam. 17:52; 1 Chron. 4:31). Scoffers declared this unlikely as no Judaean city ever had more than one gate, according to archaeological discoveries. But in 2007, an entire fortified city was unearthed having, not one, but two major gates. It overlooks the Elah Valley, confirming the Bible’s mention of it in the account of David and Goliath. I knew the Bible was accurate and reliable. But it is so faith-building to have that truth confirmed by walking through the MANY “proofs” that populate the land of Israel! David took refuge in “the stronghold” (1 Sam. 22:3,4). Masada (which means “stronghold”) was a city that sat atop a steep hill out in the middle of an arid wilderness, overlooking the Dead Sea. It’s location made it easy to see approaching enemies. It had a “snake path” up the side that could handle only two people wide at a time. It was impressive! Scholars believe that this was David’s stronghold. Now when I read about it, I will be able to see it. In You, O Lord, I have taken refuge…Be to me a rock of strength, a stronghold to save me, for You are my rock and my fortress. When I read about Jesus praying at Gethsemane (Matt. 26), I will be able to picture Him among the twisted trunks of the olive trees. I can now see exactly where He pleaded with His Father. There are so many accounts that have come alive in my mind! I can add extra senses (sight, sounds, smells, touch….) to my understanding. You don’t have to go to Israel to be touched by the love stories in the Word. But I had the opportunity to go to Beersheba. It’s in the middle of the Negev desert. 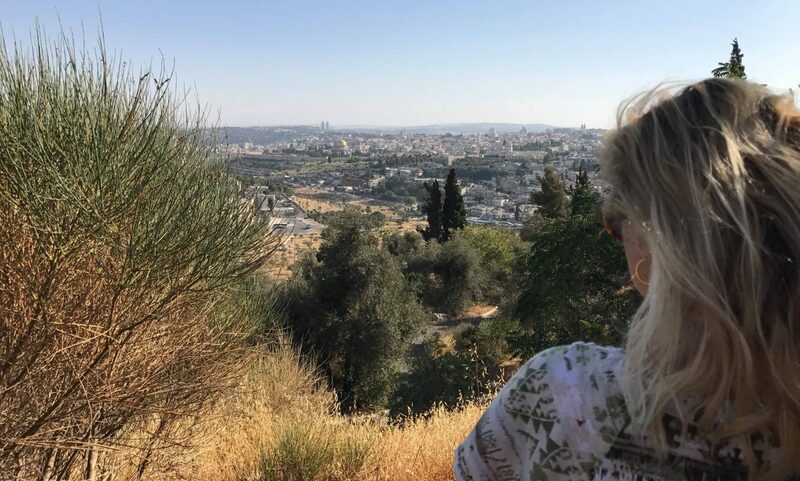 It’s where Abraham made a covenant with Abimelech and planted a tamarisk tree (Gen. 21), where he sent Hagar into the wilderness, and where he went to live after God said, “Because you have not withheld your son, your only son, I will greatly bless you….” (Gen. 22). I looked all around me and imagined the account playing out in front of my eyes. There were so many emotional moments as we walked through the land of Israel. I imagine part of that had to do with stepping away from the distractions of the world and immersing myself in the unfolding story of God’s redemption and love. My heart was revived. I pray that I will remember that I don’t have to go to Israel to do that. I can still shut out the world’s distractions and immerse myself in the beautiful and powerful message of God’s love. I hope you’ll be able to go, too, Matt! I tried to follow you on Facebook every day. As I looked at the pictures it was hard to keep the tears back. What a faith builder it was for me. Thank you for sharing! I’m so happy to hear that, Ginny! So glad I got to experience this with you, Kathy! Thank you Kathy! I thought I would not want to go but now I’m changed my mind. Once again you strengthen and confirm the Word. Thank you, Pat! I appreciate that so much! Next Next post: Can God Really Restore You?